After doing both an octopus & a jellyfish pattern, I felt the urge to add another creature to complete the sea-life theme. So I made this chubby little goldfish. I had gotten a few requests to do a goldfish before, and so this one has more of a kawaii feel than the Love Koi pair I did a while back. As with the others, you have your choice of a cat, rabbit, panda, fox, or alpaca. And it has detailed side, dorsal, and tail fins that really make it look special. Unlike the octopus and jellyfish though, it needs a lot less hand-sewing so it comes together much more quickly. To celebrate its launch, I’m offering the pattern for 50% off for the first week! I hope you’ll give it a look! And if you snagged a copy, I hope you enjoy it! 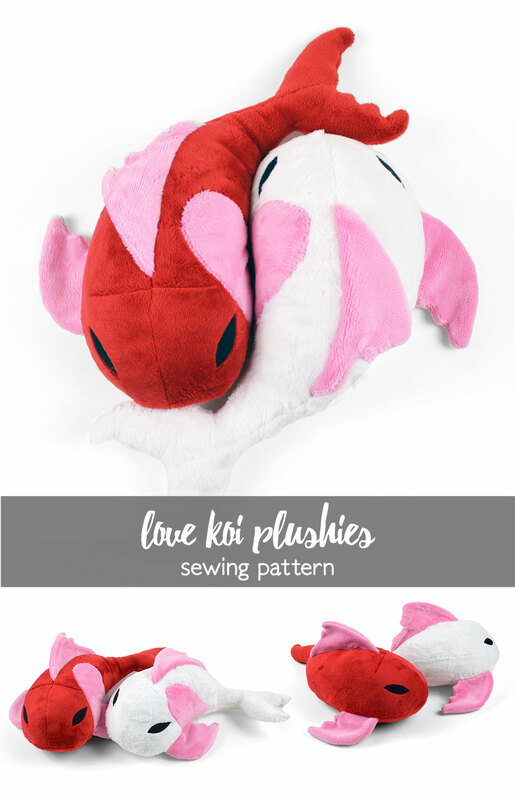 Categories: Shop, Updates | Tags: animal, creature, cute, diy, fish, goldfish, how to, kawaii, koi, pattern, pet, project, sea, sewing, stuffed, tutorial | Permalink. Are you all enjoying the start of fall? I know I am 😀 I’m so glad it’s finally October. I’m working on a lot of projects that I’m hoping to share with you in the coming weeks, and the weather down here in Florida is slowly getting more bearable. But onto the patterns! 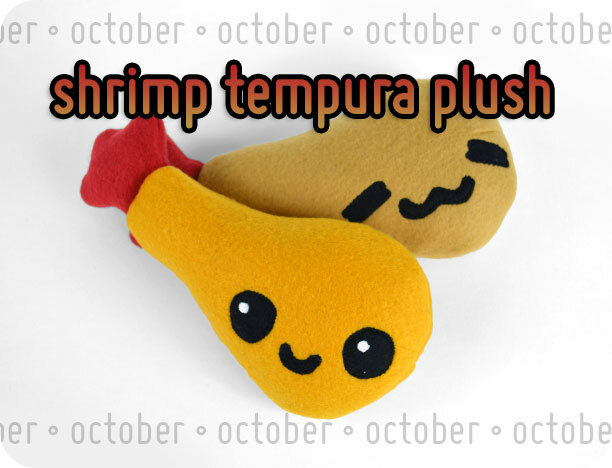 The newest free pattern I’m giving away for October is this little Shrimp Tempura Plush! You can get the pattern for this plush by signing up for email updates (found in the submission box on the right side of the page below the search bar). If you have trouble signing up, you can check out more info at the main Monthly Crafting Challenge page, the FAQ, or by emailing me. Also, bonus! for today only I’m offering both this pattern and the one from September when you sign up. After today though, the prize is just this guy 🙂 Though you can also purchase the older pattern through my Etsy if you’re too late. If you’ve already signed up for emails, that’s where the challenge comes in. You can get this pattern if you make one of the projects from this blog, my books, or my Etsy then email me or message the finished project to my Facebook where I have a really awesome collection going of your creations! Keep it up every month and you’ll get a new free pattern, so don’t forget to check back during November to see the newest creation! 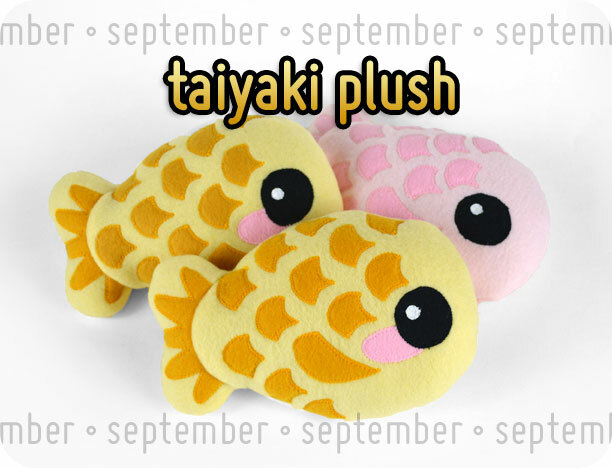 Categories: 2014 Collection, Monthly Crafting Challenge, Updates | Tags: animal, challenge, craft, cute, fish, food, free, fried, gift, kawaii, pattern, play, plush, sewing, shrimp, soft, stuffed, update | Permalink. 1 Year Blogiversary & New Monthly Crafting Challenge! As far as updates go, I still wanted to give a heads up that I won’t be able to post with free patterns every week until a few more months. I’ll should be able to post every month or so, but I’m still catching up on some other work at the moment :3 Hopefully you’ll all be able to see the fruits of my labor soon! The most exciting update, however, is the revealing of the new 2014 Monthly Crafting Challenge! For 2013 I did a set of 12 sushi plushies and challenged you all to make projects from my books, website, and store to earn more. Over 2013 I received over 60 submissions! Thank you everyone that sent me a picture of their work ^0^ It was such a blast getting to see all the new little projects everyone made, especially those of you who were just learning to sew! And above all, I’m so flattered that people went through the trouble to make my designs ;o; I can’t thank you enough. Keep up the good work, everyone, I can’t wait to see what gets made for 2014! So for the 2014 collection I’m doing… (drumroll please) Japanese snack foods! After doing a whole set of sushies, I realized just how many more awesome and delicious Japanese foods I was missing out on that weren’t sushi, so I gathered up a collection of 12 and made plush patterns for each one. Here’s a preview of what you can expect throughout the year! I still want to keep a little element of surprise each month x3 but I couldn’t resist showing off the full collection. 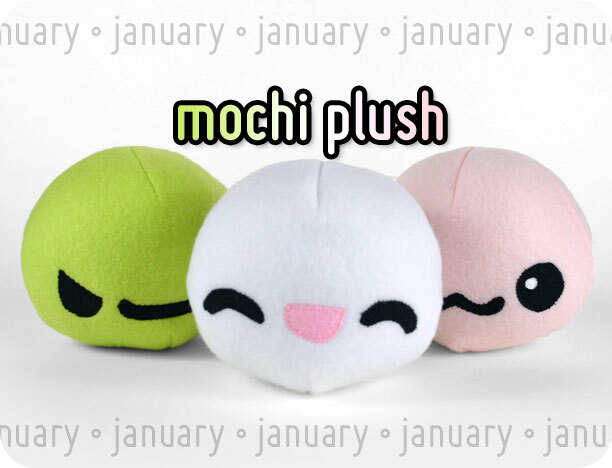 For January, the fun begins with this plush mochi! Mochi are a delicious Japanese confection made from sticky rice flour and traditionally eaten on New Year’s! (though they’re tasty all year round). The sticky rice flour is made into a thick elastic dough through rigorous pounding, then the dough is wrapped around a filling such as sweet red beans, strawberry, or ice cream. The finished treat is wonderfully chewy and sweet. I actually made a batch myself over the Christmas holiday — I personally love to fill my mochi with chocolate truffles. This project has a very simple pattern, but all the face options really make it fun. And the best part, I think, is that since mochi often come in loads of different fruit flavors from melon to lemon to green tea, you can make a whole rainbow of plushies! 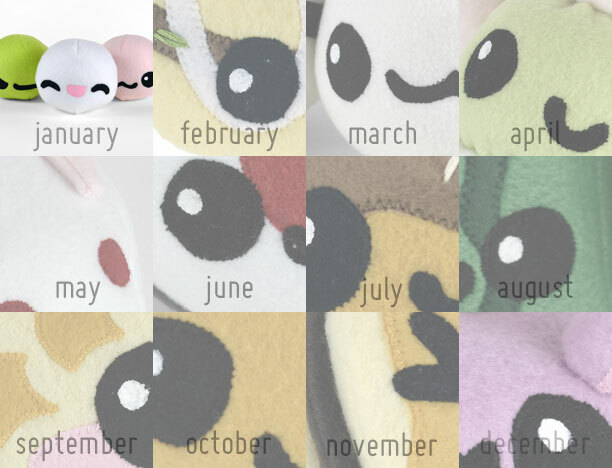 You can get the pattern for this plush by signing up for email updates (found in the submission box on the right side of the page below the search bar). If you have trouble signing up, you can check out more info at the main Monthly Crafting Challenge page, or by emailing me. Also, bonus! for today only I’m offering both this pattern and the one from December when you sign up. After today though, the prize is just this guy 🙂 Though you can also purchase the older pattern through my Etsy if you’re too late. If you’ve already signed up for emails, that’s where the challenge comes in. You can get this pattern if you make one of the projects from this blog, my books, or my Etsy then email me or message the finished project to my Facebook where I have a really awesome collection going of your creations! Keep it up every month and you’ll get a new free pattern, so don’t forget to check back during February to see the newest creation! Categories: 2014 Collection, Monthly Crafting Challenge, Updates | Tags: animal, candy, challenge, confection, craft, cute, dessert, fish, free, gift, kawaii, mochi, pattern, plush, rice, sewing, soft, stuffed, sushi, sweet, update | Permalink.